I am so fond of plots and oscilloscope traces, and one day I thought it would be nice to have plots while debugging my small C programs. I use Xcode and it has great tools like Shark and Instruments, but these are performance tools and can not show user data as far as I know. So I started googling. A solution was found pretty soon: gnuplot can do it. But to get that really working took quite a couple of steps, being described in the following. Gnuplot is a command line tool for plotting functions and discrete data. Functions or data can be entered directly from the command line, and gnuplot can read data from files. Further, it can receive data and commands from other programs via the popen() 'pipe fitting' function. GNU Octave, a free alternative for Matlab, uses gnuplot as it's interface this way. Fortunately, there is a collection of functions to do the pipe fitting from C to gnuplot, under the name gnuplot_i. Below is a description of how to get these things working together on OSX. Gnuplot sourcefiles can be downloaded from http://www.gnuplot.info/. At the moment of this writing, there was no reference to a binary version for OSX. But I already had gnuplot on my computer and for sure I did not compile it. How did it get here? With GNU Octave probably. Download GNU Octave, from http://www.gnu.org/software/octave/. In the extras folder of the mounted octave.dmg, you will find gnuplot.dmg. When you mount this one, you will find a gnuplot binary, ready to install. That is very convenient. For gnuplot to work, you need either X11 or AquaTerm as graphics terminal. X11 is (an optional) part of the OSX installation. AquaTerm can be downloaded free of charge, from http://aquaterm.sourceforge.net/. I have this app installed. Now comes the question of how to pipe commands and data from your own C programs into gnuplot. I really know nothing about that, but other people have found solutions and made these available. A C library source titled gnuplot_i is published by N. Devillard, at http://ndevilla.free.fr/gnuplot/. The download contains gnuplot_i.c, gnuplot_i.h, and three example C files to demonstrate the interface. There is also a makefile, plus instructions how to compile from the command line without the makefile. Here is where I got stuck for a while. Compiling gnuplot_i.c from the command line, following the instructions in the readme, gives gnuplot_i.o, as it should. But mixing Xcode and command line gcc is not a good idea. Xcode will not include functions from an .o file. I decide to build gnuplot_i.c as a static library, even though it is only one file. This can be done using a BSD Static Library template project. The output is libgnuplot_i.a, if the project were named gnuplot_i. It can be named differently as well. Add the example.c file, the .a library file and the header file to the project, using the menu 'project > add to project'. The library appears with the usual suitcase icon. It does not matter if it has a name different from libgnuplot_i.a, because it is not referenced by name in the header file. If only the path is set correctly. Even with the path set correctly, this may sometimes need confirmation before Xcode can find the added files. Quite obscure and annoying. The example files were flawlessly compiled and linked into an executable. However, starting up this executable resulted in an immediate crash. Why? The path to gnuplot could not be found, and a NULL pointer is returned. I was not the first one to have this problem. On http://macosx.com/forums/unix-x11/231689-gnuplot-xcode.html, 'Viro' has described his solution. The essence is: create a .plist file with the path, that can be found systemwide and not only from the terminal app. This requires a couple of steps. First you need to create a folder of the name .MacOSX in your home directory. This is an invisible folder, how can you create and see these? By default you can't. On my computer I always have them visible. That can comfortably be done with TinkerTool. There is also a cool dashboard widget by Matthew Hansen and Trevor Sayre that can switch from invisible to visible and vice versa with a simple mouseclick. Or it can be done from the terminal with the command: 'defaults write com.apple.finder AppleShowAllFiles Yes'. The paths are: /usr/bin:/bin:/usr/sbin:/usr/local/bin. These are places where executables can reside. With hidden files and folders invisible these usr directories are not accessible via the Finder, by the way. And does it work now? No, not yet. 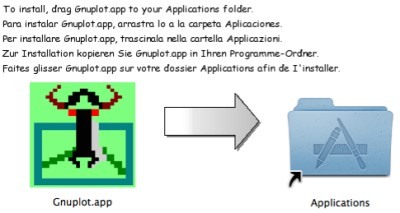 On my computer, gnuplot lives as an application in the applications folder, so there is no gnuplot executable in one of the regular bin directories. Fortunately, the app is a bundle which can be opened to show it's contents. The executables are in Contents/Resources/bin. To be honest, I did not perceive that gnuplot-4.2.3 is the executable and gnuplot is the shortcut file. I just copied both into /usr/local/bin. The administrator password is required to put or remove files there. I started the gnuplot_i example command once more, and.... wow! One after the other, functions were automatically plotted in AquaTerm windows, driven by the commands from the example file. Phew, result at last, and a great result it is. The real hard work of course is done by the people who made gnuplot and gnuplot_i, free for everyone to use. Gnuplot_i is well documented, and very user-friendly. With an absolute minimum of extra coding you can have your data and commands piped into gnuplot.